Still Thinking of Applying for a PhD Place in Physics or Astronomy? Last term I gave a short talk to interested students within the School of Physics & Astronomy here at Cardiff University about postgraduate research in which I aimed to pass on some, hopefully useful, information about how to go about applying for PhDs in Physics and Astronomy. Since the time is rapidly approaching when applications need to be sent in, I thought I’d repeat here a few general remarks that might be useful to people elsewhere who are thinking of taking the plunge when they graduate. I’m aiming this primarily at UK students applying for places in the UK; special considerations apply for students wanting to do graduate research abroad. What is a PhD? The answer to that is relatively easy; it’s a postgraduate research degree. In order to obtain a PhD you have to present a thesis like that shown on the left (which happens to be mine, vintage 1988), typically in the range 100-250 pages long. A thesis has to satisfy two conditions for the award of the degree: it should contain original research, which is publishable in an academic journal; and it should present a coherent discussion of that original work within the context of ongoing work in the area of study. In Physics & Astronomy, the PhD is pretty much a prerequisite for any career in academic research, and it usually takes between 3 and 4 years to complete. After submission of the thesis you will have to undergo a viva voce examination conducted by two examiners, one internal and one external. This is quite a tough test, which can last anywhere between about 2 and about 6 hours, during which you can be asked detailed questions about your research and wide-ranging questions about the general area. The Money Side. In the UK most PhDs are supported financially by the research councils, either EPSRC (most physics) or STFC (nuclear & particle physics, astronomy). These generally award quotas of studentships to departments who distribute them to students they admit. A studentship will cover your fees and pay a stipend, currently £14296 pa. That doesn’t sound like a lot, but you should at least remember that it is a stipend rather than a wage; it is therefore not taxed and there is no national insurance payable. There is a fee (currently £4121) payable for a PhD course, but that only comes into play if you are planning to fund yourself. If you receive a studentship it will normally cover the fee as an additional component. What I mean by that is you don’t need to pay it out of the stipend, it is separate. In top of that, research council funding also supplies a Research Training Grant which covers, e.g., travel and small items of equipment so you don’t need to pay for those out of your stipend either. How do I choose a PhD? During the course of a postgraduate degree you are expected to become an expert in the area in which you specialize. In particular you should reach the point where you know more about that specific topic than your supervisor does. You will therefore have to work quite a lot on your own, which means you need determination, stamina and enthusiasm. In my view the most important criterion in your choice of PhD is not the institution where you might study but the project. You need to be genuinely excited by the topic in order to drive yourself to keep through the frustrations (of which there will be many). So, find an area that interests you and find the departments that do active research in that area by looking on the web. Check out the recent publications by staff in each department, to ensure that they are active and to have something to talk about at interview! Qualifications. Most universities have a formal requirement that candidates for admission to the PhD should have a “good honours degree”, which basically means at least an Upper Second Class Honours degree. Some areas are more competitive than others, however, and in many disciplines you will find you are competing with a great many applicants with First Class degrees. How to apply successfully. The application procedure at most universities is quite simple and can be done online. You will need to say something about the area in which you wish to do research (e.g. experiment/theory, and particular field, e.g. cosmology or star formation). You’ll also need a CV and a couple of references. Given the competition, it’s essential that you prepare. Give your curriculum vitae some attention, and get other people (e.g. your personal tutor) to help you improve it. It’s worth emphasizing particular skills (e.g. computing). If you get the chance, make use of your summer vacations by taking on an internship or other opportunity to get a taste of research; things like that will undoubtedly give your CV an edge. The Interview. Good applicants will be invited for an interview, which is primarily to assess whether you have the necessary skills and determination, but also to match applicants to projects and supervisors. Prepare for your interview! You will almost certainly be asked to talk about your final-year project, so it will come across very badly if you’re not ready when they ask you. Most importantly, mug up about your chosen field. You will look really silly if you haven’t the vaguest idea of what’s going on in the area you claimed to be interested in when you wrote your application! Don’t be shy! There’s nothing at all wrong with being pro-active about this process. Contact academic staff at other universities by email and ask them about research, PhD opportunities. That will make a good impression. Also, don’t be afraid to ask for advice. Although we’re all keen to recruit good PhD students for our own departments, we academics are conscious that it is also our job to give impartial advice. Ask your tutor’s opinion. How many places should I apply for? Some research areas are more fashionable than others so the level of competition varies with field. As a general rule I would advise applying for about half-a-dozen places, chosen because they offer research in the right area. Apply to fewer than that and you might lose out to the competition. Apply to many more and you might not have time to attend the interviews. What’s the timetable? Most applications come in early in the new year for entry to the PhD in the following September/October. The Christmas break is therefore a pretty good time to get your applications sorted out. Interviews are normally held in February or March, and decisions made by late March. STFC runs a deadline system whereby departments can not force students to accept or decline offers before the end of March, so there should be ample time to visit all your prospective departments before having to make any decisions. Thinking of Applying for a PhD Place in Physics or Astronomy? This morning I am to give a short talk to interested students within the School of Physics & Astronomy here at Cardiff University about postgraduate research in which I aim to pass on some, hopefully useful, information about how to go about applying for PhDs in Physics and Astronomy. Since I’ve finished writing the talk more than the usual few minutes before I have to deliver it, I thought I’d jot down here a few general remarks that might be useful to people elsewhere who are thinking of taking the plunge when they graduate. I’m aiming this primarily at UK students applying for places in the UK; special considerations apply for students wanting to do graduate research abroad. The figures are taken from a Royal Society report and are, as far as I’m aware, accurate. It’s worth noting however that the level of funding under the FP7 “Framework Programme” which funds research is much smaller than the current Horizon2020 programme. However, as Stephen Curry has pointed out in a typically balanced and reasonable blog post, the impact of a BrExit on UK science is much more complex than this picture would suggest. I want to add just a few points from my specific perspective as a university-based researcher. First, the 3% figure is arrived at by a tried-and-tested technique of finding the smallest possible numerator and dividing it by the lowest possible denominator. A fairer comparison, in my view, would just look at research funded by the taxpayer (either directly from the UK or via the EU). For one thing we don’t know how much of the research funded by businesses in the UK is funded by businesses which are only here in the UK because we’re part of the European Union. For another these figures are taken over the whole R&D effort and they hide huge differences from discipline to discipline. From my perspective as an astrophysicist – and this is true of many researchers in “blue skies” areas – most of the pie chart is simply not relevant. The main sources of funding that we can attempt to tap are the UK Research Councils (chiefly STFC and EPSRC) and EU programmes; we also get a small amount of research income from charities, chiefly the Leverhulme Trust. The situation is different in other fields: medical research, for example, has much greater access to charitable funding. As it happens I’ve just received the monthly research report of the School of Mathematical and Physics Sciences at the University of Sussex (of which I am currently Head) and I can tell you the EU counts not for 3% of our income but 21% (which is in line with the proportions) above; most of that comes from the European Research Council. The possibility of losing access to EU funding alarms me greatly as it would mean the loss of about one-fifth of our research base. I know that figure is much higher in some other institutions and departments. But it’s not just the money that’s important, it’s also the kind of programmes that the EU funds. These are often to do with mobility of researchers, especially those early in their careers (including PhD students), grants that allow us to exploit facilities that we would otherwise not be able to access, and those that sustain large collaborations. It’s not just the level of cash that matters but the fact that what it funds is nicely complementary to the UK’s own programmes. The combination of UK and EU actually provides a much better form of “dual funding” than the UK can achieve on its own. Some say that BrExit would not change our access to EU funding, but I maintain there’s a huge risk that this will be the case. The loss of the UK’s input into the overall EU budget will almost certainly lead to a revision of the ability of non-member states to access these programmes. The best that even BrExit campaigners argue for is that access to EU funding will not change. There is therefore, from a science perspective, there is no chance of a gain and a large risk of a loss. For me, that kind of a decision is a no-brainer. I’m not the only one who thinks that either: 150 Fellows of the Royal Society agree with me, as do the vast majority of scientists surveyed in a poll conducted by Nature magazine. Of course there will be some who will argue that this “blue skies” academic research in universities isn’t important and we should be spending more money on stuff that leads to wealth creation. I can think of many arguments against that, but for the purposes of this post I’ll just remind you that 45% of UK research is done in industry and commercial businesses of various kinds. Where do you think the supply of science graduates come from, what kind of research draws students into science courses in the first place, and where do the teachers come from that educate the next generations? As a scientist who cares passionately about the sustainability of Britain’s research base, I think we should definitely remain in the European Union. I’m very late to this because I was away at the weekend, but I couldn’t resist making a comment on a piece that appeared in the Grauniad last week entitled How can we stop big science hovering up all the research funding? That piece argues for a new system of allocating research funding to avoid all the available cash being swallowed by a few big projects. This is an argument that’s been rehearsed many times before in the context of physics and astronomy, the costs of the UK contribution to facilities such as CERN (home of the Large Hadron Collider) and the European Southern Observatory being major parts of the budget of the Science and Technology Facilities Council that often threaten to squeeze the funds available for “exploiting” these facilities – in other words for doing science. What’s different about the Guardian article however is that it focusses on genomics, which has only recently threatened to become a Big Science. Anyway, Jon Butterworth has responded with a nice piece of his own (also in the Guardian) with which I agree quite strongly. I would however like to make a couple of comments. First of all, I think there are two different usages of the phrase “Big Science” and we should be careful not to conflate them. The first, which particularly applies in astronomy and particle physics, is that the only way to do research in these subjects is with enormous and generally very expensive pieces of kit. For this reason, and in order to share the cost in a reasonable manner, these fields tend to be dominated by large international collaborations. While it is indeed true that the Large Hadron Collider has cost a lot of money, that money has been spent by a large number of countries over a very long time. Moreover, particle physicists argued for that way of working and collectively made it a reality. The same thing happens in astronomy: the next generation of large telescopes are all transnational affairs. The other side of the “Big Science” coin is quite a different thing. It relates to attempts to impose a top-down organization on science when that has nothing to do with the needs of the scientific research. In other words, making scientists in big research centres when it doesn’t need to be done like that. Here I am much more sceptical of the value. All the evidence from, e.g., the Research Excellence Framework is that there is a huge amount of top-class research going on in small groups here and there, much of it extremely innovative and imaginative. It’s very hard to justify concentrating everything in huge centres that are only Big because they’ve taken killed everything that’s Small, by concentrating resources to satisfy some management fixation rather than based on the quality of the research being done. I have seen far too many attempts by funding councils, especially the Engineering and Physical Sciences Research Council, to direct funding from the top down which, in most cases, is simply not the best way to deliver compelling science. Directed programmes rarely deliver exciting science, partly because the people directing them are not the people who actually know most about the field. I am a fan of the first kind of Big Science, and not only for scientific reasons. I like the way it encourages us to think beyond the petty limitations of national politics, which is something that humanity desparately needs to get used to. But while Big Science can be good, forcing other science to work in Big institutes won’t necessarily make it better. In fact it could have the opposite effect, stifling the innovative approaches so often found in small groups. Small can be beautiful too. Finally, I’d have to say that I found the Guardian article that started this piece of to be a bit mean-spirited. Scientists should be standing together not just to defend but to advance scientific research across all the disciplines rather than trying to set different kinds of researchers against each other. I feel the same way about funding the arts, actually. I’m all for more science funding, but don’t want to see the arts to be killed off to pay for it. Some good news arrived today. We had been hoping to hear it since September but it finally appeared today. It involves several physicists from the Atomic, Molecular and Optical (AMO) Group of the Department of Physics & Astronomy in the School of Mathematical and Physical Sciences here at the University of Sussex who bid to participate in a major investment (of ~£270M) in quantum technology overseen by the Engineering and Physical Sciences Research Council (EPSRC). Today we learned that Sussex physicists were successful in their applications and in fact will participate in two of the four new Quantum Technology “hubs” now being set up. One of the hubs is led by the University of Oxford and the other by the University of Birmingham. We will be starting work on these projects on 1st December 2014 (i.e. next Monday) and the initial funding is for five years. Congratulations to all those involved, not just at Sussex but also in those other institutions participating in the new programme. For a relatively small Department this is an outstanding achievement for Sussex, and the funding gained will help us enormously with our strategy of expanding laboratory-based experiment physics on the University of Sussex campus. Since I arrived here last year it has been a priority for the School to increase and diversify its research portfolio, both to enhance the range and quality of our research itself and to allow us to teach a wider range of specialist topics at both undergraduate and postgraduate level. This particular subject is also one in which we hope to work closely with local comanies, as quantum technology is likely to be a key area for growth over the next few years. I’m very excited by all this, because it represents a successful first step towards the ambitious goals the Department has set and it opens up a pathway for further exciting developments I hope to be able to post about very soon. You can find more information about the Quantum Technology hubs altogether here. Sussex scientists have been awarded £5.5 million to develop devices that could radically change how we measure time, navigate our world and solve seemingly impossible mathematical equations. The grants, received by members of the University’s Atomic, Molecular and Optical Physics (AMO) research group, represent part of a £270 million UK government investment announced today (26 November) to convert quantum physics research into commercial products. Quantum technology is the applied field of quantum theory. It includes such phenomena as “quantum entanglement”, the idea that objects are not independent if they have interacted with each other or come into being through the same process, and that changing one will also change the other, no matter how far apart they are. 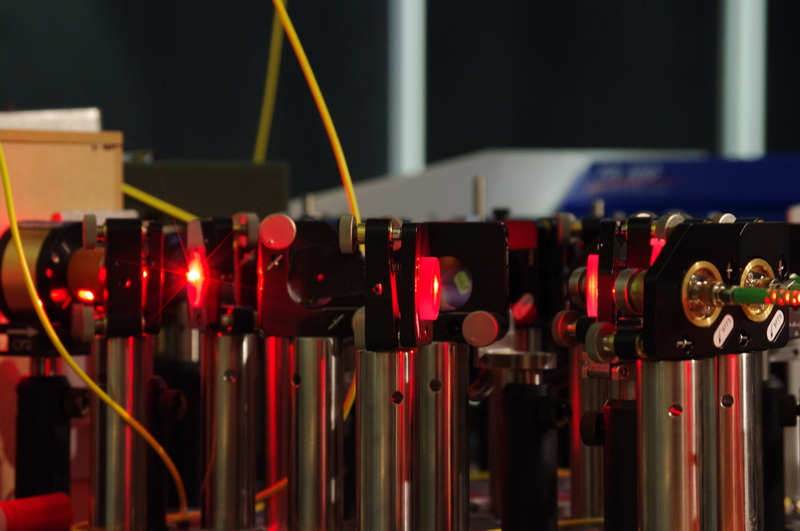 Members of the AMO group have become part of two major national quantum centres: the UK Quantum Technology Hub on Networked Quantum Information Technologies and the UK Quantum Technology Hub for Sensors and Metrology. These centres bring together universities and industry to develop and construct quantum technologies. Dr Jacob Dunningham will be developing a theory to understand how remote objects can be detected with exquisite precision by making use of a networks of sensors linked by quantum entanglement. Dr Winfried Hensinger, as part of one hub, will develop the quantum processor microchip architecture and a new technique of quantum processing using microwave radiation to enable the construction of a large-scale “super-fast” quantum computer. As part of the other hub, he will develop powerful portable sensors able to detect magnetic fields with unprecedented accuracy utilizing a new generation of microchips capable of holding arrays of individual charged atoms. Dr Alessia Pasquazi will develop miniature, ultra-fast, photonic sources of light that form the heart of a new generation of quantum sensors and navigation devices. Dr Marco Peccianti will shrink to the size of a shoe box an “optical frequency comb”, a highly accurate clock currently found only in state-of-the-art laboratories. Prof Barry Garraway will design new rotation sensors for compact navigation devices using atom-chip technology. Dr Matthias Keller will develop a network connecting several quantum processors through the exchange of single photons, resulting in a new version of the internet, the so-called ‘quantum internet’. The research will be supplemented by a significant Sussex investment and will make use of the world-leading multi-million pound quantum technology laboratories located at the University. Greg Clark, Minister of State for Universities, Science and Cities, said: “This exciting new Quantum Hubs network will push the boundaries of knowledge and exploit new technologies, to the benefit of healthcare, communications and security. “Today’s announcement is another example of the government’s recognition of the UK’s science base and its critical contribution to our sustained economic growth”. It’s the time of year when final-year students start to think about the possibility of doing a PhD after they have graduated, so I I thought I’d jot down here a few general remarks that might be useful to people who are thinking of taking the plunge. I’ve posted on such matters before, but this is something that comes around every year so I hope you’ll excuse the repeat. I’m aiming this primarily at UK students applying for places in the UK; special considerations apply for students wanting to do graduate research abroad. The Money Side. In the UK most PhDs are supported financially by the research councils, either EPSRC (most physics) or STFC (nuclear & particle physics, astronomy). These generally award quotas of studentships to departments who distribute them to students they admit. A studentship will cover your fees and pay a stipend, currently £13590 pa. That doesn’t sound like a lot, but you should at least remember that it is a stipend rather than a wage; it is therefore not taxed and there is no national insurance payable. What’s the timetable? Most applications come in early in the new year for entry to the PhD in the following October. The Christmas break is therefore a pretty good time to get your applications sorted out. Interviews are normally held in February or March, and decisions made by late March. STFC runs a deadline system whereby departments can not force students to accept or decline offers before the end of March, so there should be ample time to visit all your prospective departments before having to make any decisions. Here are some of the slides I used for a talk on such matters a year or so ago, which you might find useful. Should UK Research Funding Be Reorganized? A couple of recent news items spurred me on to reflect a bit about the system of research funding in the UK. The first of these was an item I noticed a while ago in Research Fortnight about the (ongoing) Triennial Review of the research councils, and specifically, input from the Wellcome Trust to that review that was rather critical of the Science and Technology Facilities Council and suggested it might be dismantled. For context it’s probably a good idea to look back to the formation of STFC in 2007 via the merger of the Particle Physics and Astronomy Research Council (PPARC) and the Council for the Central Laboratories of the Research Councils (CCLRC). Previously, PPARC had looked after particle physics and astronomy (including space science) and CCLRC had run large experimental facilities in other branches of science. The idea of merging them wasn’t silly. A large chunk of PPARC’s budget went on managing large facilities, especially ground-based astronomical observatories, and it was probably hoped that it would be more efficient to put all these big expensive pieces of kit under the same roof (so to speak). However, at the time, there was considerable discussion about what should happen in general with science grants. For example, physicists working in UK universities in areas outside astronomy and particle physics previously obtained research grants from the Engineering and Physical Sciences Research Council (EPSRC), along with chemists, engineers and even mathematicians. Some experimentalists working in these areas used facilities run by the CCLRC to do their work. However, astronomers and particle physicists got their grants from PPARC, the same organisation that ran their facilities and also paid subscriptions to international agencies such as CERN and ESA. These grants were often termed “exploitation” or “responsive mode” grants; they involved funding for postdoctoral researchers and staff time used in analysing observational or experimental data and comprised relatively little money compared the the cost of the PPARC facilities themselves. PPARC also funded PhD studentships and postdoctoral fellowships under the umbrella of its Education and Training division, although needless to say all the Education and Training involved was done in host universities, not by PPARC itself. The question was whether the new merged organisation, STFC should continue giving grants to university groups or whether the responsibility for doing this should be moved elsewhere, perhaps to EPSRC. At the time, most astronomers were keen to have their research grants administered by the same organisation that ran the facilities. 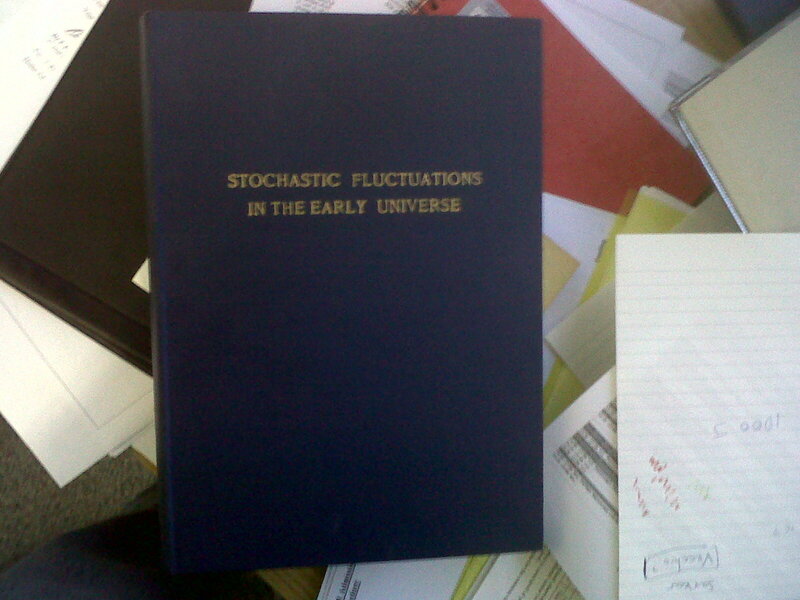 I thought it made more sense to have research scientists all on the same footing when it came to funding and in any case thought there were too many absurd divisions between, say, general relativity (EPSRC) and relativistic astrophysics (PPARC), so I was among the (relatively few) dissenting voices at the time. There were other reasons for my unease. One was that, during a previously funding squeeze, PPARC had taken money from the grants line (the pot of money used for funding research groups) in order to balance the books, necessarily reducing the amount of science being done with its facilities. If STFC decided to do this it would probably cause even more pain, because grants would be an even smaller fraction of the budget in STFC than they were in PPARC. Those EPSRC physicists using CCLRC facilities seem to have managed pretty well so I didn’t really see the argument for astronomy and particle physics being inside STFC. The other reason for me wanting to keep research grants out of STFC was that the (then) new Chief Executive of PPARC, Keith Mason, had made no secret of the disdain he felt towards university-based astronomy groups and had stated on a number of occasions his opinion that there were too many astronomers in the United Kingdom. There are two flaws with this argument. One is that astronomy is essential to the viability of many physics departments because of its appeal to potential students; without it, many departments will fold. The other problem is that Mason’s claim that the number of astronomers had grown by 40% in a few years was simply bogus. This attitude convinced me that he in particular would need only the slightest excuse to divert funds away from astronomy into areas such as space exploration. It all seems a very distant memory now, but six or years ago UK physics (including astronomy) was experiencing a time of relative plenty. The government had introduced a system whereby the research councils would fund research groups on the basis of the Full Economic Cost of the research, which meant more money coming into research groups that were successful at winning grants. The government increased funding for the councils to pay for this largesse and probably diminished the fear of another funding pinch. Astronomers and particle physicists also felt they would have more influence over future strategy in facility development by remaining within the same organisation. In the end what happened was that STFC not only kept the portfolio of astronomy and particle physics grants, but also acquired responsibility for nuclear physics from EPSRC. But then, in 2007, just after STFC came into existence, a major financial disaster broke: that year’s comprehensive spending review left the newly formed STFC with a huge gap in its finances. I don’t know why this happened but it was probably a combination of gross incompetence on behalf of the STFC Executive and deliberate action by persons higher up in the Civil Service. The subsequent behaviour of the Chief Executive of STFC led to a public dressing down by the House of Commons Select Committee and a complete loss of confidence in him by the scientific community. Miraculously, he survived, at least for a while. Unfortunately, so did the financial problems that are his legacy. I don’t like to say I told you so, but that’s exactly what I am going to dp. Everything that happened was predictable given the initial conditions. You might argue that STFC wasn’t to know about the global economic downturn.As a matter of fact I’d agree. However, the deep cuts in the science budget we have seen have very little to do with that. They all stem from the period before the Credit Crunch even started. Although Prof. Mason was eventually replaced (in 20111), the problems inherent in STFC are far from solved. The last Comprehensive Spending Review (2010) was less bad for STFC than some of us feared – with a level cash settlement which still holds. In real times the funds are now being eroded rather than being slashed further, but the situation remains very difficult because of past damage. I don’t think STFC can afford to settle for flat cash at the next spending review. The new Supreme Leader Chief Executive of STFC, John Womersley, said much the same thing at last night’s RAS dinner, in fact. I know this preamble has been a bit long-winded, but I think it’s necessary to see the background to what I’m going to propose. These are the steps I think need to be taken to put UK physics back on track. First, the powers that be have to realize that university researchers are not just the icing on the cake when it comes to science: they actually do most of the science. I think the new regime at STFC recognizes this, but I’m not sure the government does. Another problem is that that the way scientists are supported in their research is a complete mess. It’s called the dual support system, because the research councils pay 80% of the cost of research grants and Higher Education Funding Councils (i.e. HEFCE in England) are meant to provide the other 20%. But in reality it is a bureaucratic nightmare that subjects researchers to endless form-filling and costs hundreds of millions in wasteful duplication. This was true enough of the old Research Assessment Exercise, but has been taken to even higher levels of absurdity by the forthcoming Research Excellence Framework, the decisions coming out of which will be more influencing by guesswork and institutional game-playing than actual research excellence. The Research Councils already have well-managed systems to judge the quality of research grant applications, so do we really needed the REF on top of them? The second article I referred to in the introduction, on a study showing that Research Council grant income, appeared in last week’s Times Higher. That study shows -at least at institutional level – that the two streams are pretty closely correlated. While REF/RAE income is awarded on a retrospective basis, and grant awards are based on proposals of future activity, it should be a surprise that people with a good track-record are also good at thinking up interesting new projects. Moreover, panels such as the STFC Astronomy Grant Panel (of which I am a member) certainly take into account the applicants’ track-record when assessing the viability of research proposals. So if we don’t need two systems, what could we have instead? Moving grants from STFC to EPSRC, as some proposed in the past, would go part of the way, but EPSRC has many problems too. I would therefore prefer to see a new organisation, specifically intended to fund blue-skies scientific research in universities. This organisation would have a mission statement that makes its remit clear, and it would take over grants, studentships and fellowships from STFC, EPSRC and possibly some of the other research councils, such as NERC. The new outfit would need a suitable acronym, but I can’t think of a good one at the moment. Answers on a postcard. As a further suggestion, I think there’s a strong case to be made that HEFCE should be deprived of its responsibility for research funding. The apparatus of research assessment it uses is obviously flawed, but why is it needed anyway? If the government believes that research is essential to universities, its policy on selectivity doesn’t make any sense. On the other hand, if it believes that university departments don’t need to be research groups then why shouldn’t the research funding element be administered by a reserch organisation? Even better, a new University Research Council along the lines I have suggested could fund research at 100% of the Full Economic Cost instead of only 80%. The substantial cash saved by scrapping the REF should be pumped into grants to be administered by the new organisation, reversing the cuts imposed we’ve endured over past years. So what should STFC become after the Triennial Review? Clearly there is still a role for an organisation to manage large experimental facilities. However, the fact that the UK now has its own Space Agency means that some activity has already been taken out of the STFC remit. The CERN and ESO subscriptions could continue to be managed by STFC along with other facilities, and it could in some cases commission projects in university research groups or industrial labs as it does now. Astronomers and particle physicists would continue to sit on its Board. However, its status would change radically, in that it would become an organisation whose job is to manage facilities, not research. The tail will no longer be wagging the dog. I very much doubt if these suggestions are at all in line with current political “thinking” nor with those of many of my colleagues. The input to the Triennial Review from the Institute of Physics, for example, is basically that nothing should change. However, I think that’s largely because most of us working in STFC area, have much greater confidence in the current management than we did in the previous regime rather than because the structure is right. Some of the bureaucrats in the Treasury, RCUK and HEFCE won’t like my suggestion either, because they’ll all have to go and do something more useful. But unless someone stands up for the university sector and does something to safeguard future funding then the ongoing decline in funding levels will never be reversed. I very much doubt if many of my fellow physicists or astronomers agree with my suggestion either. Not to worry. I’m used to being in a minority of one. However, even if this is the case I hope this somewhat lengthy post will at least get you thinking. As always, I’d be interested in comments..